it's been a strange week. i've pulled back from much of my online activities, not really doing much more than spinning the wheel and answering quiz questions (annoyed at myself that one day i was sure i answered 3 questions, if not 4, but somehow only 2 were registered, though i still have 100% correct, if not the full number). i've taken a few photos, but they are still in the camera. i haven't done the night video most nights - attributed to too much work, too little sleep. and obviously i haven't blogged. - went running three times!! Love the picture of Claire! Great job of getting back to running. Thought I was missing your blogs but I guess they were not there to read! I feel better. I think you got it~! Needing a little rest is okay, it's your body talking to you. Claire is the star of that picture! Beautiful picture of Claire and glad you're all right! Your stats are amazing with al, you fit into a day. Your week may have been strange but you've accomplished much. Keep up the great work. I NEVER ever have 100% at Trivia after day 1 (and sometimes not even then . . . ). Claire looks completely happy in Maui!! And YOU are doing great! Good to know you are ok, just busy. Take the time you need to be healthy. We love hearing from you, but your mental health comes first. And life can get overwhelming! Especially since you are still working. Gorgeous pic of Claire! Such a positive week and great plans for the next! Add in one beautiful dog, and life looks very good! 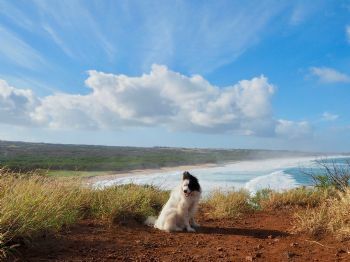 Looks like Claire is loving Molokai. Great job. I'm not getting the steps in myself, because the tri training plan has cycling and swimming that Fitbit does not count well. And it's not worth it to me to try to artificially mess with the automation! You're doing great! Welcome back to running! Keep on living life, fully... on line will still be here when you have time. Stellar accomplishments......great planning for the upcoming week...carry on! That picture of Claire looks like an oil painting. Happy to see you are back online.